If the staff member is not certificated, but is filling a position that requires a certificate, the SEID number 9999999999 may be used in order to report the staff member as a teacher on the course and section enrollment reports (CRSE and SCSE). End of employment date is also required for any staff member who has left and was reported to CALPADS in the past year. Total Years of Service in the LEA/District and Total Years of Educational Service – Update annually. Staff Step 1a: To update this required information one staff record at a time, navigate to the User Management Screen and select the staff record that requires updates by selecting the “Actions” button and “Edit User”. 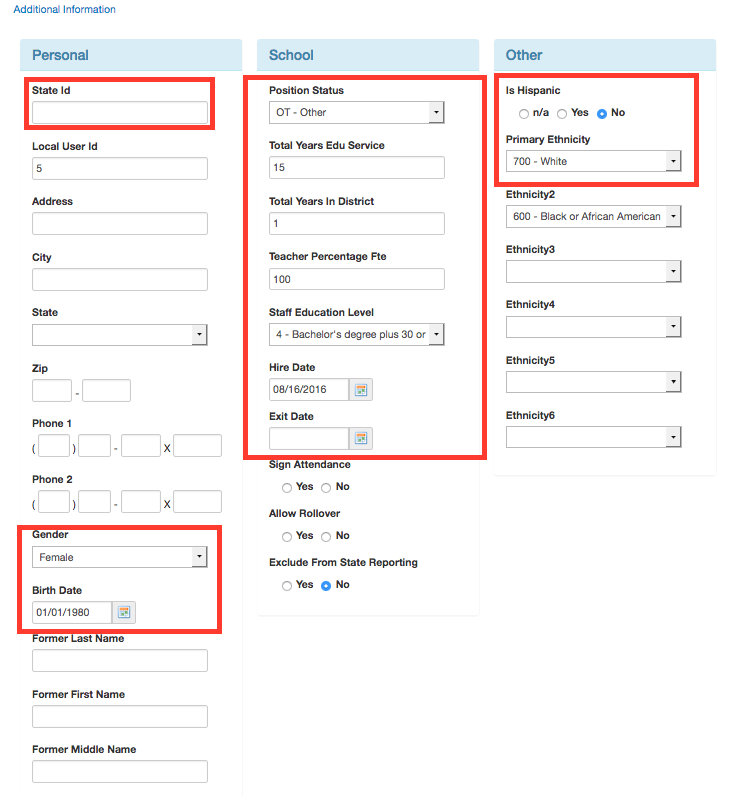 Staff step 1b: Select “Additional Information” and enter the required fields as shown in the screenshot below. Within the staff record in Illuminate, there is an additional screen specifically for a CALPADS staff assignments and Job Classifications. *Note: Credentials for 2016-17 are no longer required by CALPADS to properly report the course section enrollments. Start Date: Required if staff member is new or a new role has been added to an established staff record. CALPADS allows for open, continuous records and expects the records to be closed only if the job classification has changed or employment has ended. For example: A Non-Certificated Teacher at a charter school (Code 26) earns a full CA Credential, then the Code 26 may be closed by providing an end date and a new Code 12 – Teacher – job classification shall be opened. Staff Step 2b: Staff Assignment screen – Required for Administrators (Certificated and Non-Certificated) and Pupil Services codes only. 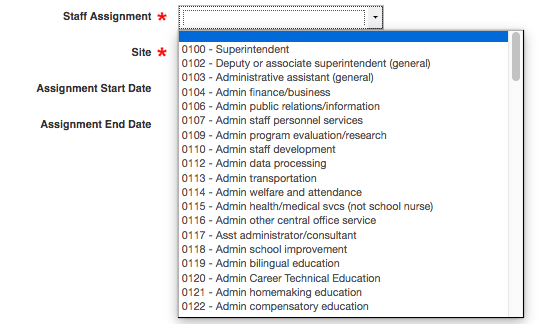 Staff Assignment – choose a Non-Classroom Based Job Assignments from the drop down menu for Codes 10, 11, and/or 25 only. Assignment Start and End Dates are not required unless new staff records are created or updates are made to a staff member’s responsibilities. 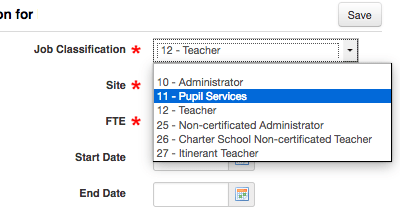 Example 1: If an Administrator is listed as the Principal of the school and this continues for more than one year, there is no need to provide an end date to the Staff Assignment of Principal once it has been created. Example 2: A Vice Principal has been given additional responsibilities after his/her first year such as Administrator of Staff Development in addition to the Vice Principal code, a new staff assignment would be added to the staff record with an appropriate start date. Once a complete demographic record has been established with a State ID, and the job classifications/staff assignments are updated, a troubleshooting report may be run by navigating to Reports > State Reporting screen in Illuminate. Select both the SDEM (Staff Demographics) report and the SASS (Staff Assignment Report) for each school site to validate the number of records being reported to CALPADS. The Validation Logs will easily identify staff records with incomplete information, so be sure to utilize that functionality within Illuminate for each report you run. Staff demographics and assignment records will only be exported/reported if a proper State ID is entered. The 9999999999 SEID number will not report anywhere other than on the Course/Section Enrollment Reports. Missing State IDs (SEID numbers) will not be found via validation logs. Use the SDEM report to compare to your file in Step 1: Preparation to ensure all expected staff are exporting onto your report. Next step: Course Section Enrollment (CRSE) and Student Course Section Enrollment Reports (SCSE).